Photograph depicts from L-R: Louise Sylvester, likely Ruby Sylvester, and Rachel Sylvester. 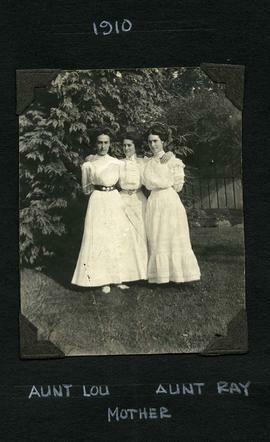 They are standing in a yard in white dresses. Written on verso: "Surly oaf bothered by war news 1940". Photograph depicts Cecelia Sylvester standing in the yard of a house. Written on verso: "Cecelia Sylvester". 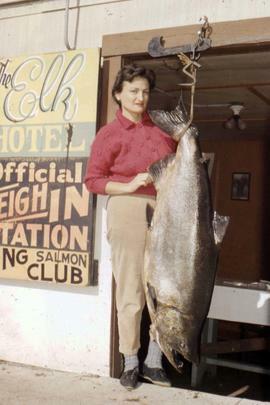 Cecelia Sylvester was the wife of Frank Sylvester. Photograph depicts Cecelia, wife of Frank Sylvester, standing in the backyard. Photograph depicts Cecelia, wife of Frank Sylvester, with daughters. Photograph depicts a portrait of Louise Sylvester. Written on verso: "Louise Sylvester". Photograph depicts a portrait of Cecelia Sylvester. Written on verso: "Mrs. Cecelia Sylvester". Photograph depicts a portrait of Ceclia Sylvester (nee Davies), wife of Frank Sylvester. Written on verso: "Mrs Frank Sylvester". Photograph depicts a portrait of Mrs May Bennett, wife of W. A. C. Bennett.